The release of Nixon The Mission was the moment Android Wear got serious. Its inclusion on Nixon's surf and skiing smartwatch shows that Android Wear can be more than just another operating system on the wrist. It's an unashamed monster outdoor smartwatch. Hot on the heels of the Casio WSD-F10 Outdoor Smartwatch, it boasts a killer spec sheet, aggressive design and will pique the interest of surfers and skiers. 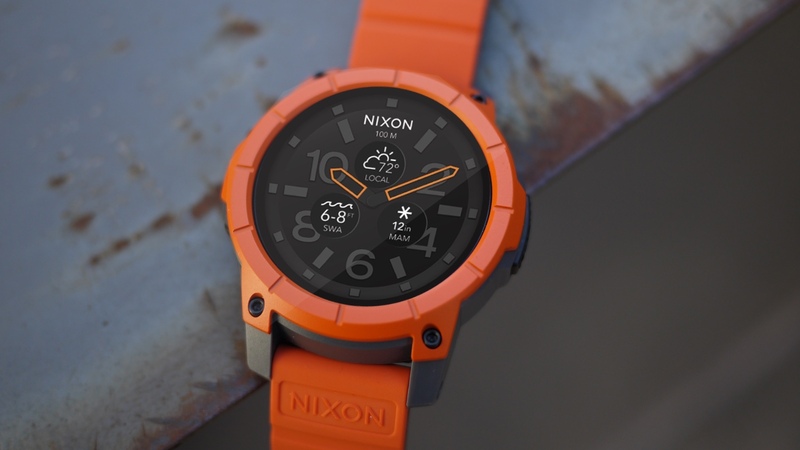 Nixon is also a cool brand – perhaps the most so of all the smartwatches to date. Headline features include the 100 metres of water resistance and built-in GPS, but like Casio, Nixon has also placed an emphasis on bespoke apps, enriching the experience for its surf and ski-obsessed user base. But for those looking to fork out on the best outdoor smartwatch, can it match up to the likes of Garmin and Suunto's formidable array of devices? And can Nixon add the dose of edgy cool that's made its fashion watch lineup such a barnstorming success? Read on to find out. We shoot straight here at Wareable, so understand us when we say that the Nixon is bloody massive. The 48mm case dwarves most G-Shock timepieces and it's every bit as large as the Casio WSD-F10. The rugged design is water-resistant to 10 ATM (roughly 100m) and adorned in 316L surgical grade stainless steel. That means you can take it surfing and it will withstand even the most spectacular wipe-out. But clearly, it's also a big fashion statement. Unless you're in the position that you can afford a $400 smartwatch and only use it for the odd weekend surf, it's going to be part of your daily look – in this case Oakley sunglasses, board shorts, a beady necklace and a massive Nixon smartwatch. We don't like to gender categorise either, but we can't see The Mission being a huge hit with the ladies, just due to the size. Feel free to let us know if we're wrong on that point. In terms of colour, The Mission comes with a host of options – 44,000 according to Nixon, if you include all the colour, bezel and strap choices. That's a moot point currently, as we can only spy options for black, orange and grey available to pre-order, with a single strap choice. Hopefully, the other 43,997 variations will be out when the device goes live on 10 October. The orange version is a massive design statement and we actually really like it. In our opinion the black is so bland it actually nullifies all positive aspects of the design. Our main review unit was black, and was the one we wore the most, and contributed to negative feelings about the overall look. The orange version you see in the pictures didn't have the final software on it, so we couldn't make a full judgement on that. However, the 48mm build allows for some decent additions inside. The 1.39-inch AMOLED, 400 x 400 screen isn't blighted by a flat tyre, which allows the screen to be perfectly round. It's a superbly crisp display and while it doesn't blow you away with its vibrancy, there are certainly no complaints from us. In fact, it's the same resolution as the 1.4-inch Huawei Watch, so it's sitting at the top table in terms of Android Wear pixel density. Nixon has also put a lot of engineering time into the microphone, which uses a neat clip and a Gore-Tex membrane to ensure top notch waterproofing. That means you can bark commands while you're on the slopes, take calls from the office while shredding the black run, or summon apps to monitor your progress. This isn't to be underestimated. Getting your phone out on a ski lift in sub-zero conditions is a good way to lose it/batter the battery with the temperature change – with The Mission, there's no need. There's a button on the side of The Mission, which toggles the device in and out of its low power state and will return you to the main watch face from within an app. The strap itself is a replaceable ultra-tough and rugged rubber number that you almost need to crank onto your arm to tighten. It's actually pretty comfortable, even if, like The Mission, it's huge. Under the hood is a brand new Qualcomm Snapdragon Wear 2100 processor, which is about as good as it gets in terms of smartwatch internals right now. We don't get too hung up on processor speeds here, but it's the power-saving that Qualcomm touts as one of its headline benefits. And the Nixon will need it. With GPS built in, the battery will be under serious pressure – more on that later. All-in-all, it's a formidable package, especially for surfers and skiers – and one that many readers have been waiting for. So what does The Mission bring to the party? Well, it's worth kicking off with its party piece: The Mission app. This Android-only app tracks surfing and skiing locations, offering up data on the conditions, weather and suitability for getting outdoors. You can view this on your smartphone and via The Mission app, which appears within the Android Wear apps list. Aside from this, there's a special The Mission watch face, which permanently displays the current conditions in your favourite surf or ski spot. That means you can grab your board and head down to the beach should you see that the surf's up, for example. The app is nicely designed and the watch face integrations really help give The Mission a sense of purpose – this is what it's designed for. For skiing you get the current weather, temperature, wind speed, when snow last fell and when it's predicted to fall next. You can then scroll through a five-day forecast, each showing inches of snow, how many ski lifts are in operation and how many runs are open. In terms of surfing you get details on the size of waves, wind, weather, high/low tide times, and you can set up shred alerts too. If you hand-off to your Android phone, you can also get a daily written report for most surfing hotspots. For regular surfers and skiers, this is pretty priceless information, delivered to the wrist in a useful and user-friendly way. In the same vein, there are also the Trace Snow and Trace Surf apps. These are actual trackers for your water and on-piste activities, although essentially just third-party Android Wear apps pre-installed onto The Mission. These will track your ski and surf sessions, logging time and distance. It's not a superb amount of data, but you can utilise the $199 stick on sensor for your board/skis to get serious data recorded on the watch. That's a great partnership, but again, one for serious boarders. Elsewhere, there's little that differentiates The Nixon from any other Android Wear watch. It delivers notifications from the wrist, Google Now and all that jazz. We won't list every facet of Android Wear here, read our full guide if you want to know more. Currently, The Nixon runs Android Wear 1.5 – and it will benefit from Android Wear 2.0 when it lands. Android Wear watches are compatible with iOS, but this wasn't a pleasant experience in our testing. Things were fraught due to iOS 10, which should be ironed out by launch, but there's no timescale for The Mission app to hit the App Store, and it's nowhere near as powerful without its official companion app. In terms of sensors, The Mission is packed. There's a thermometer, altimeter, barometer, e-compass, gyrometer, accelerometer, and humidity sensors all on board. With GPS built into The Mission it scores a big one-up on the Casio, which can only borrow from a connected smartphone. That will make it the target of outdoors types, who might be looking to the likes of the Fenix 3 – another powerful outdoor wrist-beast. Unfortunately, the GPS performance is slightly mixed. We have no problems with the accuracy of The Nixon, and on our test runs distances were more or less inline with our TomTom Spark running watch. What's more, with so much location aware data populating the ecosystem, such as surf and snow activity, the GPS represents much more than just outdoor runs. However, its impact on battery life is a big issue. One time, we went for a run with 24% of the Nixon's battery remaining and it was dead within 40 minutes. On another occasion, after wearing The Mission all day (from a full charge at 7.30am) we went for an hour's run in the evening with GPS turned on, from a starting position of 50%. We used The Mission for Tough Mudder, as well. And that three-hour GPS life rang pretty true. We turned it on at the start of the race, completed the course in 2.50, and it had about 10% of battery life left at the end. The mud, freezing water and bumps and knocks on the Tough Mudder course didn't bother it at all. It was absolutely caked in dry mud at times and, after a the next dip in the water cleared the display, we found it still recording every time. As such, we've bumped the original score up a mark – no other Android Wear watch could offer this level of ruggedness, while at the same time tracking a GPS route. It survived the run but was at around 7% and in power saving mode before we'd finished our warm down. That means about 3 hours of running, which sounds okay – but if you're out all day at work, you'll struggle for more than an hour's jog when you get home. The bigger issue is for hikers and outdoor types. There's no way the Nixon's GPS can handle a day out in the hills, even on a fresh charge – Garmin can rest easy for now. Battery life is actually one area it unexpectedly falls down against the Casio. A big part of Casio's proposition is the power-saving mode which enables it to operate as a watch for a month(!) at the push of a button. For those who are camping and surfing, The Mission's power-hungry nature is going to be an absolute nightmare. Android Wear's app ecosystem is still fairly sparse in terms of titles that can take advantage of built-in GPS. It's something that perhaps Nixon should have designed within The Mission's app. Battery life wasn't spectacular across The Mission as a whole. Two days is achievable but if we were conservative we'd place it at a day and a half – not brilliant given the size and potential for battery space. What's more the charger is awful. The weak magnet sometimes came loose if not on a perfectly flat surface, and early in the review period we often returned to find The Mission partially charged. For die-hard surfers and skiers, The Mission has the power to delight. The Mission app is thoughtful and useful, and features such as the microphone, 10ATM of waterproofing and Trace app mean it’s not just a superficial smartwatch – you can go out there and get it dirty. However, as a general outdoors watch, it’s no competition to the likes of Garmin and Suunto. Poor battery life and mediocre Android Wear apps means the Nixon feels lukewarm, and the enormous size means careful consideration is required before investing.